People do just as well with in-home physical therapy, a study has found. Patients who choose at-home physical therapy instead of in-patient rehabilitation after knee replacement surgery do just as well when it comes to complications, long-term pain management and movement recovery, new research indicates. "Based on the findings, patients are encouraged to consider going home so they can receive their aftercare in a home environment instead of at an in-patient rehab facility," said study lead author Dr. Douglas Padgett, chief of the Adult Reconstruction and Joint Replacement Service at a Hospital for Special Surgery in New York City. "Many patients may also feel more comfortable in a familiar home setting during their recovery," he added. Dr Padgett explained that their study was sparked by a growing tendency to send knee surgery patients directly home from the hospital, rather than to a rehab center. "With our study, we wanted to make sure this would not affect patient outcomes. If hospitals are telling patients they can have all of their rehab at home, it was important to make sure they would do just as well at home," he said. To date, only a handful of small studies have explored the issue, Padgett said. He added that the trend has been driven, in part, by a growing reluctance from private insurance companies and Medicare to cover the cost of in-patient rehab expenses. The findings, presented this week at the American College of Orthopaedic Surgeons annual meeting in Las Vegas, should be viewed as preliminary until published in a peer-reviewed journal. Padgett said that standard recovery time for knee replacement surgery can run anywhere from two to four months. Typically, patients assigned for in-patient rehab care stay about two weeks, receiving physical therapy roughly six days per week, sometimes followed by in-home or outpatient care after they return home. By comparison, those sent directly home are generally visited by a home-care physical therapist three days per week for up to six weeks. 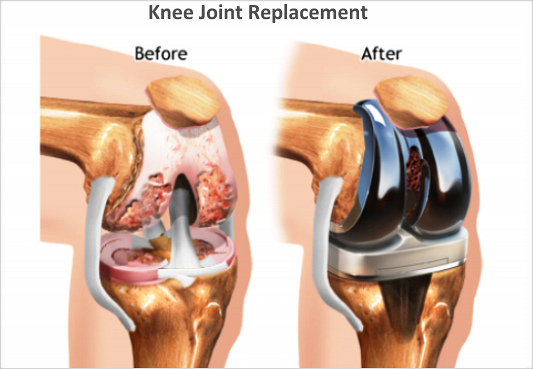 The current comparative analysis involved more than 2,400 patients who'd had knee replacement surgery between 2007 and 2011. Their average age was 66. 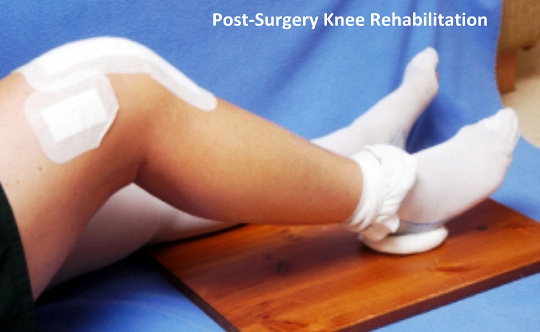 Almost 90 percent had undergone knee replacement as a result of debilitating osteoarthritis. The investigators looked back at how patients who chose one or the other option fared, with careful attention paid to ensuring that the two groups were similar in terms of age, overall health status and postsurgery mobility status. All patients completed multiple surveys: a pain and function survey prior to surgery; a complication survey six months following surgery; and another pain and function survey two years out. No difference was seen between the two groups at the six month post-surgery mark in terms of infection risk, knee stiffness or other complications. Nor was any difference seen two years out in terms of progress made, pain experienced or ability to move. The study findings "indicate that patients who go straight home do as well as those who go to an in-patient rehab facility," Padgett said. The team also found that patients who were sent to a "skilled nursing facility" fared just as well two years out as those who had been sent to a standard in-patient rehab center. Dr. Bheeshma Ravi, an orthopaedic surgery resident at the University of Toronto in Ontario, Canada, said the findings seemed to line up with indications from earlier investigations. "Researchers who previously looked at home physio versus rehab following either total hip or total knee replacement surgery in the Canadian context also did not find a difference in outcome," he noted. He added that that study, conducted in 2008, was in fact a randomized and controlled trial, ensuring that all patients were comparable except for their post-surgical method of recovery. "But in the real world, overall, the persons we tend to send for in-patient rehab are usually the ones who really need it. That would tend to be an older person, for example, or someone who is very frail, or lives alone without added social support," Ravi explained. "So it's obviously much cheaper to be cared for at home," he said, noting that the 2008 study pegged in-patient rehab at $15,000 per person, compared with $11,000 for at-home care. "But ideally, further research would try to identify the key patient characteristics that suggest specifically who will actually benefit most from rehab and who would do just as well going home."